The objective of CONCERT is to develop a content ecosystem encompassing all relevant players which will be able to perform intelligent content and network adaptation in highly dynamic conditions under uncertainty. This ecosystem will have as basis emerging information-/content-centric networking technologies which support intrinsic in-network content manipulation. The project will consider uncertainty aspects in the following two application domains: a) social media networks based on user generated content and b) CDN-like professional content distribution. Three dimensions of uncertainties will be addressed: heterogeneous and changing service requirements by end users, threats that may have adverse impacts on the content ecosystem, as well as opportunities that can be exploited by specific players in order to have their costs reduced. In order to manage and exploit the uncertainty aspects, CONCERT defines a two-dimensional content and network adaptation framework that operates both cross-layer and cross-player. First, the decision on any single adaptation action needs to take into account context information from both the content application layer and the underlying network. Second, we consider joint content and network adaptation in order to simultaneously achieve optimised service performance and network resource utilisation. Finally, some complex uncertainty scenarios require coordinated content and network adaptation across different ecosystem players. In this case, inconsistent or even conflicting adaptation objectives and different levels of context knowledge need to be reconciled and are key research issues. In order to achieve adaptation solutions capable of coping with different uncertainties, the project will develop advanced learning, decision-making and negotiation techniques. Learning is required for deriving accurate system behavioural patterns according to the acquired context knowledge. This will then drive decision-making functions for taking the most appropriate adaptation actions to address these uncertainties. Negotiation techniques are required for resolving potential tussles between specific content/network adaptation objectives by different players in the content ecosystem. 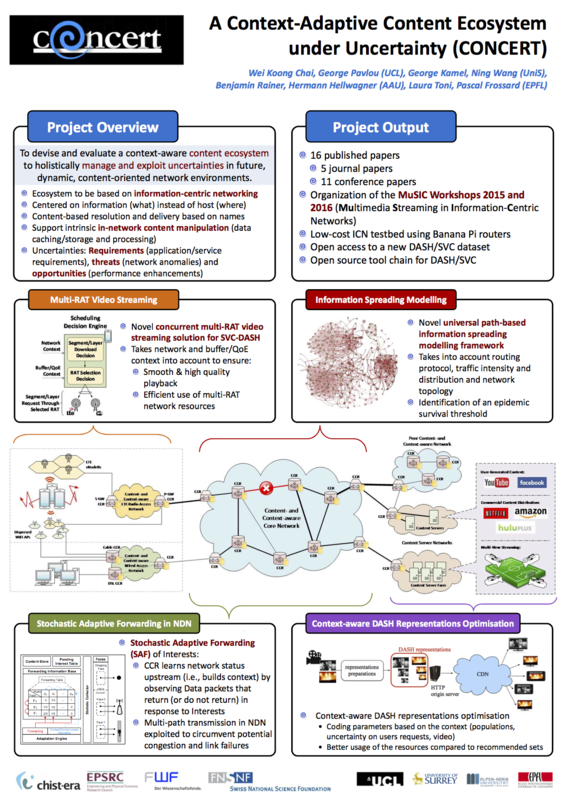 The project will consider both centralised and distributed approaches in which learning and decision-making processes on adaptation actions can be performed either at the central adaptation domain controller or in a decentralised manner across multiple network elements. In the latter case, emerging information-/content-centric networks will become much more intelligent, with content-aware devices performing self-adaptation according to their own context knowledge but through coordination in order to achieve global near-optimality and stability. Below is a CONCERT poster presented in April 2016 at the CHIST-ERA event in Bern, Switzerland. 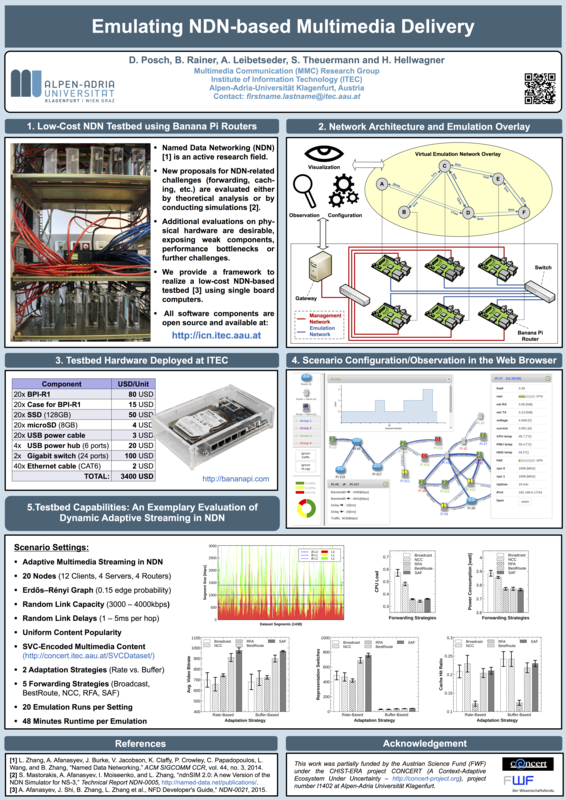 Below is a CONCERT poster for the testbed demonstration presented in April 2016 at the CHIST-ERA event in Bern, Switzerland. Copyright © 2014 The CONCERT Consortium.